It’s been too long since I last reviewed a Laphroaig. And considering the last one was from port casks it’s time to get back to bourbon cask basics. This was bottled by Menno and CJ of Whiskybase for their Archives label. It’s the first of two 1998 Laphroaigs they’ve put out (I have a bottle of the other but who knows when it will be opened). This is claimed to be 13 1/2 years old, but let’s not upset the Scotch Whisky Association. I don’t actually remember purchasing this sample. Those of you who’ve purchased from Whiskybase know that they always kindly include a few 20 ml samples. But as I have two of these, and as I’ve been purchasing samples in pairs (so as to have more to taste) I think these must have been purchased too. Nose: Dry, cereally peat at first followed by sweet, medicinal notes, ink, kelp and some charred, fatty meat. The notes integrate and get deeper as it sits in the glass. After a minute the meaty note is quite pronounced–sweet ham of some kind–and the inky note gets stronger too. With a lot more time there’s some vanilla as well and it expands some. With a few drops of water the lemon that had emerged late on the palate is quite pronounced on the nose, mixed in with the vanilla, meaty smoke and some wet stones (cobblestones after a rain shower). Palate: Very close to the nose with the sweet notes leading, and the ink, in particular, out in front. The savoury quality is more reminiscent of fatty blue fish than pork here. Much more lemon on the third and fourth sips and more salt too and some acidic smoke. Okay, let’s add water. Oh, water makes this pop. The lemon gets brighter, the smoke gets tarrier and the sweetness frames it all. Finish: Long. Gets drier and much smokier and much more ashy and tarry as it goes. The salt that emerges late on the palate hangs around for a while too and the smoke becomes more mellow. Water keeps the lemon going and brings out the wet stones from the nose. Comments: Ah, Laphroaig, how I do love you. This is just a tad too sweet and is missing a certain punch in the mouth aspect that I like in (relatively) young Laphroaigs. Better with water, I think. 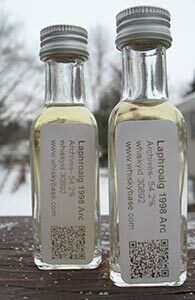 This entry was posted in -Whisky by Rating, 85-89 points, Archives (Whiskybase), Laphroaig, Whisky by Bottler. Bookmark the permalink.